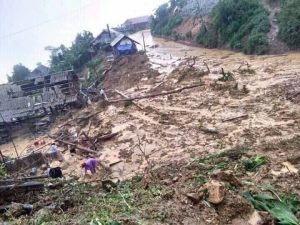 Between 22 to 24 June, torrential rains (323 ml within 48 hours) caused widespread flooding and destructive landslide in Northern provinces of Ha Giang, Lai Chau, Lao Cai, Son La, Cao Bang, Dien Bien, Tuyen Quang, Thai Nguyen, Yen Bai, and Quang Ninh, of which Lai Chau and Ha Giang were the most affected. Between 22 to 24 June, torrential rains (323 ml within 48 hours) caused widespread flooding and destructive landslide in Northern provinces of Ha Giang, Lai Chau, Lao Cai, Son La, Cao Bang, Dien Bien, Tuyen Quang, Thai Nguyen, Yen Bai and Quang Ninh, of which Lai Chau and Ha Giang being the most affected. 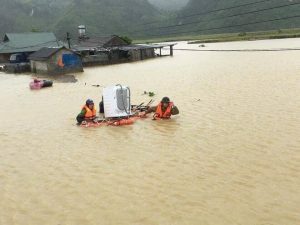 Prime Minister sent urgent letter to request local authorities and committees for national disaster prevention and control to take measures to respond to the flood/flash flood. Local authorities of Ha Giang, Lai Chau, Lao Cai took lead in search and rescue efforts as well as assisted affected people to repair houses. According to VNRC’s information, affected people needs basic items, WASH and livelihood recovery as well as disaster resistant houses.